I've finally painted my ikea box after having it put together for a week or so. My room is mostly pink, as you can see from the photo below. I have one wall covered with lilly wallpaper but have a few things painted lilac and blue. It sounds like a lot of colours in one room but my bedroom is pretty big and there is only a small amount of each colour (apart from the pink). I had a lot of blue paint left from painting my mirror so I decided to use that up aswell as a cream sample pot I had in the shed and I think its worked out quite nicely. It took a few coats as the wood soaked up the paint so quickly but it was really sunny out so dried super fast. I really want to buy a mirror and lean it against the wall behind the boxes so I don't have to use a tiny mirror but I haven't come across one that I really like yet. 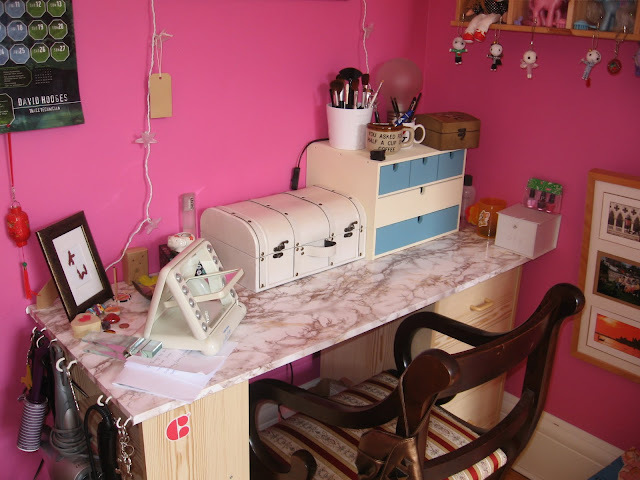 This used to be my old school desk but I never used it for homework, I always took up the front room or dining room table. To jazz up the plain pine wood I covered the top with marble sticky plastic from Taskers. My chair stands out in my room like a sore thumb but I love it. I got it for free when I was working in an art gallery. They had hundreds there for an exhibition then gave them away for free when it ended. Its so comfy and I love the curves of the wood and the patterned cushion. 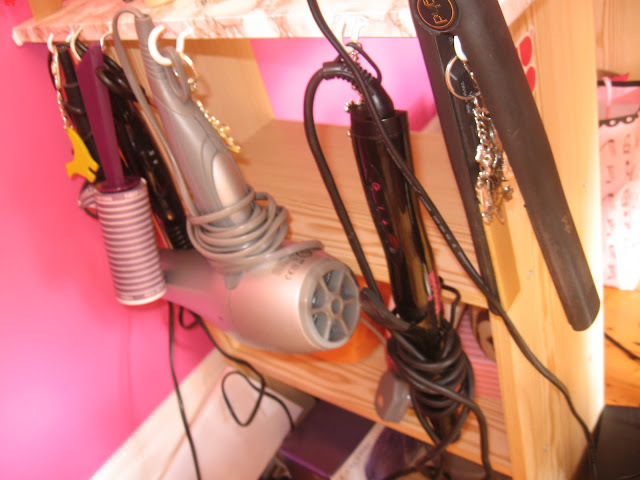 I have some hooks on the end of the table which I hang my stying tools on such as my hair dryer, curling tongs, straightners and other bits and bobs. Using this method you dont have wires all over the place. 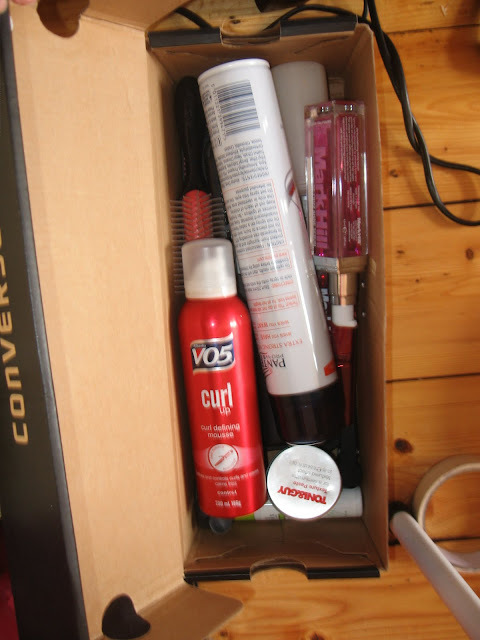 On the floor by my desk I have a box with all my hair products I use for styling such as serum, hair spray etc These are just in my converse box as the hair spray is huge! 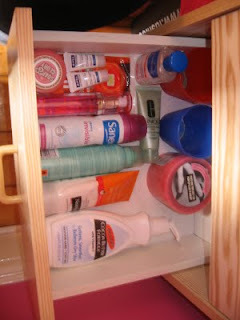 In the cream chest I have all my face products. To the left are all my blushers, middle are my concealers and foundations and to the right is my bronzer, sponges and a flanel. Yes I only have one bronzer, I have very pale skin, me and bronzers don't really work well but I am planning on trying Nars Laguna soon. Even though you can't see the bottom very well, I've covered it with Cath Kidston sample fabrics so the bottom can be cleaned from product drop-out. On the top of the ikea box I have all my brushes in a plant pot. I used Blair's (juicystar07) and everyone elses idea with this and filled the pot with silver beads to hold all my brushes. 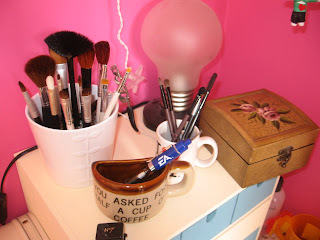 In the tiny mug I have all my tweezers, spongetip aplicators and any brushes I hardly ever use. In the half mug I have a pen to right down any ideas I come up with and I just have my sharpener on the top. I love this brown box, it was a christmess present to my mum from her friend but she didn't like it so passed it on to me. Its been in my bedroom for a year or two with nothing in, I just couldn't find anything to put in it untill I bought the ikea box. 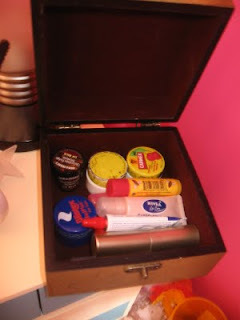 I had too many lip balms to fit in the lip compartments so I put them in here. 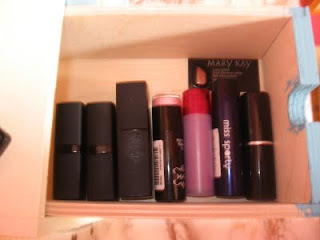 In the top left draw I have my lipsticks aswell as my Mary Kay lipstick sample. 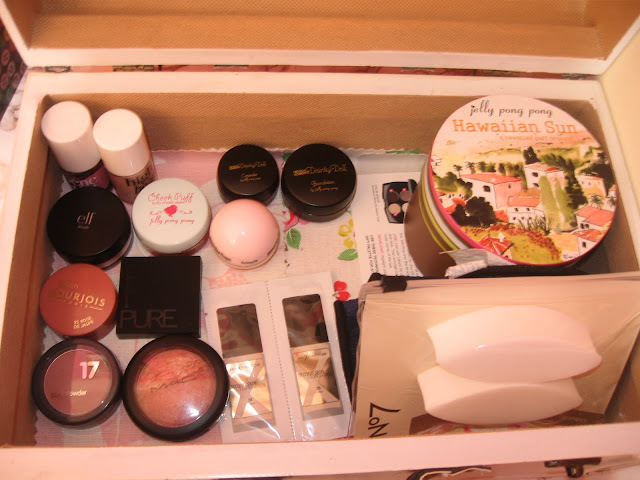 The middle top draw holds all my lipglosses, there are a few missing as I keep some in my bags for everyday use. 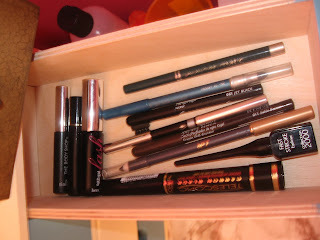 In the top right draw I have my eyeliners and mascaras. 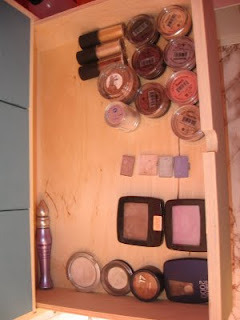 In the bottom draw I have my palettes and trios/quads. 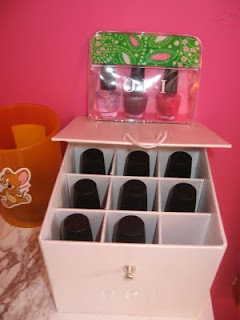 I store all my OPI polishes in one of their boxes with the minis on top in their little bag. I will do a post soon showing the colours I have. 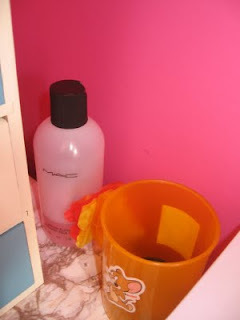 To the left of my polishes I have a cup which holds my bobbles, then next to that is my Mac brush cleanser (need to buy a new one soon) I usually have three boxes which contain cotton balls/pads/q-tips behind the cleanser but they were in my front room when I took this photo. 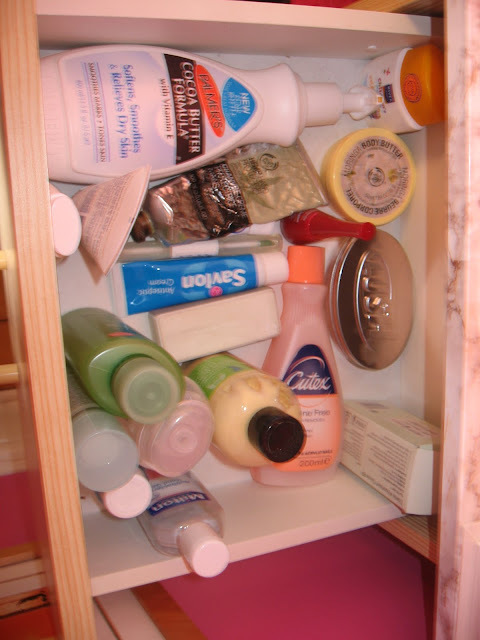 In the second draw I have all my backup products, I always have back-ups of certain products such as deodorant as it's really annoying when you run out and you have to be somewhere. 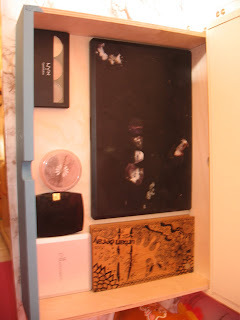 In the bottom draw I have all my perfumes I'm not using that the moment, I didnt take a photo of this draw as they are all in boxes and its such a mess. I need to sort it out. I always have the perfume I am using on top of my dresser next to the chest. At the moment I'm using DKNY Women.